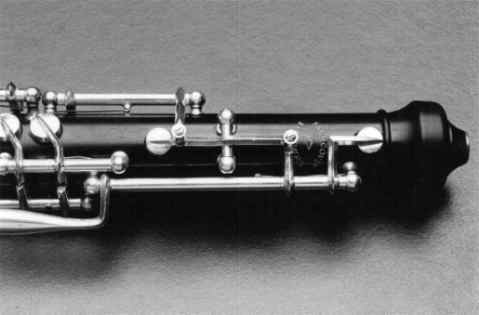 The Covey oboe is designed in response to the needs expressed by professional oboists. The bore shape, tone hole shapes and locations are a result of Mr. 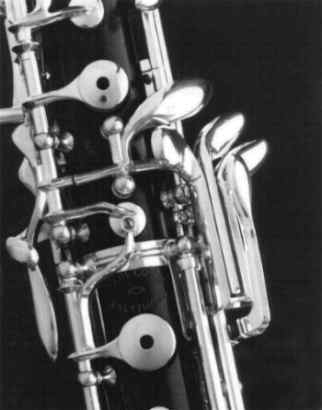 Covey's research and close working relationship with a number of highly respected oboists. The result is an instrument with dark centered tone, excellent projection, flexible nuance, even scale and sensitive linkage. The tone of the Covey oboe is warm, resonant, solid, and centered with a dense texture. These qualities give depth and character to short notes as well as long notes. They also give excellent sound projection in all performance situations. Players can use a wider range of reeds than on brighter oboes to achieve the sound and handling characteristics they want. This, and our oboes' flexibility, aid in the bending of color and pitch to create the musical line. The Covey oboe has a key mechanism that feels smooth, small and comfortable to the hands. 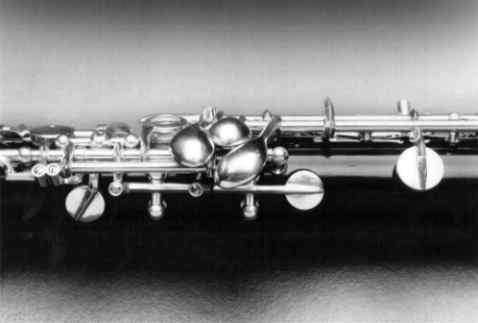 Key shape, key placement, and spring tensions are designed to help the oboist's technique. Each instrument is hand-assembled in our small shop, from installation of posts to soldering and fitting of keys and springs. In assembling the keys on their rods and between their posts, great care is taken to make them an exact fit, thus preventing poor pad seating and lost motion. This attention to detail makes slurs smooth, permits light finger pressure and allows true full note production in fast technical passages. The low register notes are in tune with the rest of the oboe. The low register C# is one half step above the C natural and one half step below the D natural. 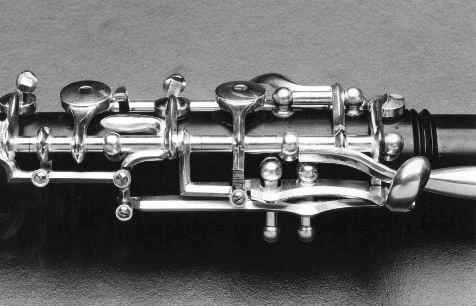 It is not flat as on many other oboes. The left hand notes on both registers are dark, having sufficient resistance and color to match notes in the right hand. The middle D natural is warm, resonant and not sharp in pitch or low in color. The middle register E natural is stable, in tune and resonates with a full tone. The middle F natural is not flat in pitch and color. The middle F# and G natural are up in pitch and color. They do not require special reed scraping or pinching the reed. Slurs to the upper C# and D natural are made easier by tuning them slightly lower. The extreme high register is in tune and easy to slur to or articulate. Lock screws are put on all pivot screw posts and all posts near the end of a joint to prevent the posts from turning. Delrin inserts line all top and bottom joint tone holes to keep the instrument working even if it cracks, improve pad seating and ease pad maintenance. All Grenadilla wood body, professional model instrument. Handcrafted, silver-plated, nickel silver keys. Fully inserted tone holes in the top and bottom joints for better sealing, reduction of maintenance costs, and protection in the event of a crack. Solid walnut case or black leather over wood case, with case cover, Starrett screwdriver and, of course, a cork grease holder. 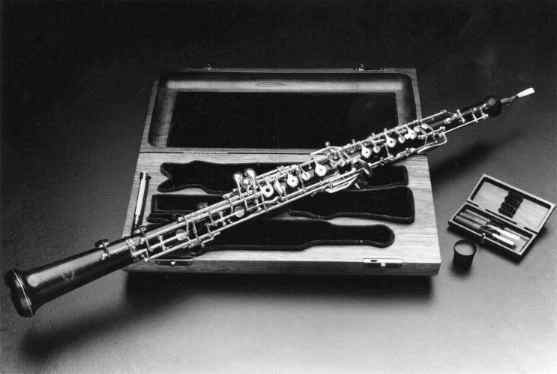 Oboists considering purchasing a Covey oboe will be sent instruments from which to choose. A week trial period is standard. To purchase a Covey oboe, please contact Shawna Lake, of OboeChicago, 847-815-9644, to verify price, options and delivery date. Please see "New Instruments" tab for current pricing. As a new Covey oboe owner, you are protected by a full year warranty, covering workmanship, tuning refinements, crack repair, and minor adjustments. We ask that you call and describe what you need, and ship the oboe to us. We will then correct the problem and return it to you... we want satisfied Covey players. Paul Covey was John Mack's first oboe graduate from the Cleveland Institute of Music. In 1970, after working with repairman Hans Moennig in Philadelphia, he founded his own shop in Baltimore. This shop then grew into Paul Covey, Inc.: builders of the Covey oboe, woodwind repairers and suppliers of all kinds of oboe accessories. In October 1996, the shop moved to Atlanta, included a new business partner, Ginger Ramsay, and became officially Covey Oboes. In 2007 Covey Oboes moved to Blairsville, our current home.